The Khwarizmi had a sizeable realm until defeated by the Mongols in 1231. Fleeing westwards after this defeat, Kwarizmian troops have since served as mercenaries in the Middle East. 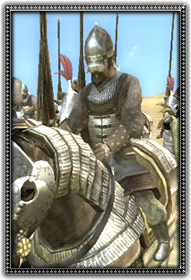 These Khwarizmi are well equipped and well protected troops and make formidable heavy cavalry, ready and able to fight for whichever eastern power can afford them.